Sound Projector - "Issue 16 - 2007-08"
Sound Projector - "Issue 16"
Wow, what a find! 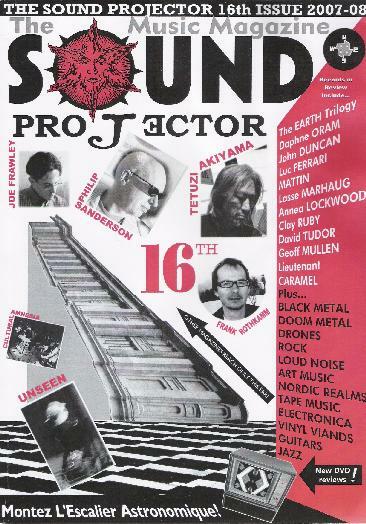 Sound Projector is a print music magazine published in England that is as truly alternative as the idea can get. From the first pages I knew this was going to be a gem, seeing reviews of CDs on the Last Visible Dog, Digitalis and Fonal labels. The music covered is wonderfully all over the map. Every imaginable type of experimental, psychedelic, folk, ambient, metal and international music are all game for Sound Projector. There are separate sections for covering Black Metal, Noise, Stoner & Doom rock, avant-rock, improvised music, experimental music, free jazz and much more. The reviews are well written and informative, criticism is constructive, and they are DESCRIPTIVE (emphasis there as I hate reviews that only reflect the writers desire to be witty and don't tell you what the music sounds like). And each review includes a web site address and/or email so you don't have to Google to find everything that sparks your interest. They also have interesting interviews, some with artists I wasn't familiar with that aroused my interest, particularly guitarist Tetuzi Akiyama and experimental musician/filmmaker Philip Sanderson. And Sound Projector makes a stellar effort at digging into the depths of the underground. They even have separate sections on the UK and US undergrounds. And any format is game for coverage, as I saw lots of cassettes and CDRs along with the CDs and vinyl. You just don't find many print music magazines of this diversity and quality. It's very professionally done and is a whopping 186 pages!! Be sure and check out the web site and click the downloads link to download the full color, 116 page, PDF format Krautrock Kompendium, which is a collection of all the reviews of Kosmische music that have appeared in all issues of the magazine. US residents should note that given the double value of the UK pound over the US dollar, along with the cost of mailing this thick sucker makes it fairly expensive. But believe me when I say it's worth it. It'll take you weeks to work your way through it. I was reading at my computer because I kept finding bands I wanted to check out. Highest recommendation. For more information you can visit the Sound Projector web site at: http://www.thesoundprojector.com.